The monuments located close to the north-east corner of the Rahal were arranged roughly in rows parallel to this reservoir, this means 15 degrees diverging from the orthodox eastern direction. This so-called “Northern Group” consisted of several isolated sanctuaries and two enclosed temple complexes, they are listed as monuments D - K by Lunet de Lajonquière. South of Prasat D and not far away is Prasat Banteay Pichean. It is directed eastwards and therefore not a part of the north-eastern group but marking the begin of the southern group. The monuments closest to Koh Ker`s main temple complex of Prasat Thom are five isolated temples belonging to the north-eastern group. Each of them shelters a decorated monolithic Lingam of enourmous size on equally huge Yoni pedestals, which symbolizes the female genital. This is why the five single structures are called Linga-temples, named from G to K and numbered 277 to 281. All Linga temples open to the Rahal. They are square towers and now roofless. These five sandstone towers were wider and taller than their predecessors in Roluos and Angkor. 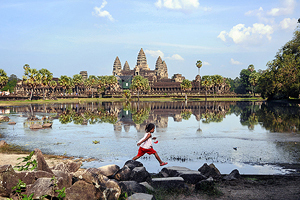 The increased size of both the building and the Lingams, which are some of the largest known in Khmer art, is a notable characteristic of the architecture of Koh Ker. Lunet die Lajonquière assumed that this development in size was only managable by extending the use of wooden carpentry. The largest Linga-temple is called Prasat Balang. Other names are Prasat Leung Moi, Prasat Ling or monument I. It enshrines one of Cambodia`s largest and best preserved Lingams ever found. This Shiva-phallus is 2 m high and almost 1 m wide. Both Lingam and Yoni were carved out of the bedrock. Prasat Theng, listed as Prasat H, is situated close to Prasat Balang and is very similar to it in design and size. The tower is built of sandstone, too, and shelters a Linga of almost the same size. Its Yoni pedestal is decorated with Garudas and Nagas. Prasat Leung Bye or Prasat F is on the other side of the road. This smaller ruin is the temple closest to the north-east corner of the former Rahal reservoir. 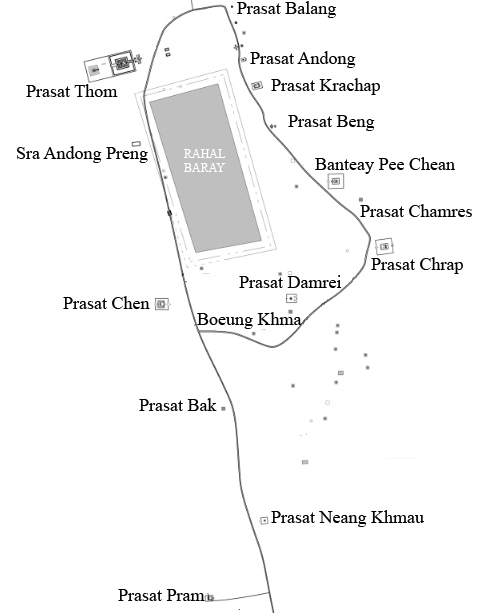 Confusingly, on some maps not this Linga temple, but Prasat Andong Kuk is called Prasat F.
Prasat Leung Bon, also spelt Leung Buon and listed G is the neighbour of Leung Bye. 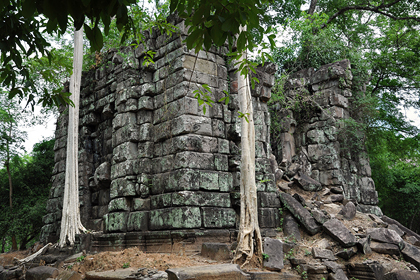 It is built of huge sandstone blocks, which is a charcteristic of the style of Koh Ker. The large Lingam is in ruins. The reliefs of the Yoni have been looted. There are traces of a Gopuram gateway behind this Prasat. The last of this very similar single temples is simply called the “Linga Shrine” or Prasat E. It is the south-western of the five Linga temples and very close to the small complex of Prasat Andong Kuk. This delightful small complex is surrounded by an enclosing wall. Most of the buildings inside the enclosure are in ruins, but the main Gopuram from the east is in a sound condition. The central shrine sheltered a Lingam, as an undated inscription on a door pillar at Prasat Andong reports that temple was consecrated to a Lingam which was erected by a Brahmin priest, whose name ends in -sharman. He is said to have served several kings mentioned in the very same inscription: After invoking many gods and legendary Khmer kings of Cambodia, the inscription gives eulogies of Yashovarman I, Harshavarman I, Ishanavarman II, and Jayavarman IV, which is remarkable in so far the latter ones were rivals. This inscription also records the erection of a Linga of large size at Shambhu, which is interpreted as a reference to the main Linga on the pyramid of the Prasat Thom complex. All in all, the architecture of Prasat Andong Kuk resembles that of so-called hospital chapels from a much later period, built by Jayavarman VII in the late 12th century all over the empire. 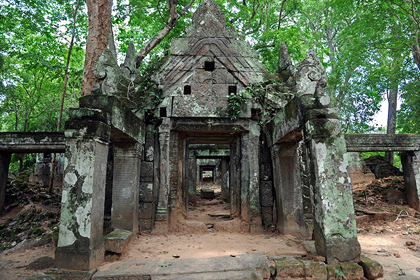 Such a late date for this temple indicates that Koh Ker was not completely left but still inhabited in the later Angkorian periods. Known as the temple of inscriptions, Prasat Krachap is located about 200 metres east from the north-east corner of the Rahal. Originally, Prasat Krachap had five Prasat towers built of brick and in quincunx order on a shared platform, four of them square and one rectangular. All were oriented towards the Rahal Baray. This quincunx was enclosed by two laterite walls, the first (inner) one with pillared galleries opening to the outside. The Gopuras to the east and west were of laterite with pillars in sandstone. The large Gopuram had a roof covered with tiles supported by a wooden superstructure, this is indicated by some holes in the stones. A second enclosure also has Gopuras to the east and west, originally they could have been built in wood. The western Gopura has the doorways and pillars carved with around thirty inscriptions from the period of Jayavarman IV, in large script. 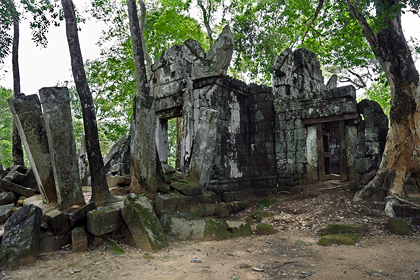 Despite the desolate condition of most buildings Prasat Krasap is a delightful place and also historically interesting due to the density of its structures and some stone carvings depicting Shiva on Nandi as well as inscriptions. They mention the date of consecration 928, the year when Koh Ker became the capital. The temple inscriptions in Khmer, particularly K. 183 were studied be the renowned French scholar George Coedès, they mainly list the names of slaves and record many donations. Among the places mentioned in the donations are Bhimapura, Amoghapura, and Ugrapura. 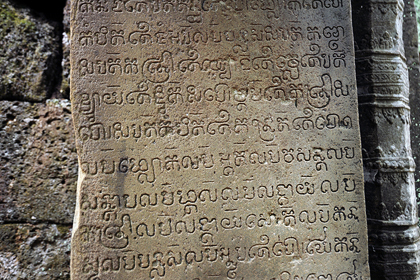 A Sanskrit inscription on the door pillars of Prasat Krachap, dated 928, consecrates this temple to Tribhuvanadeva. 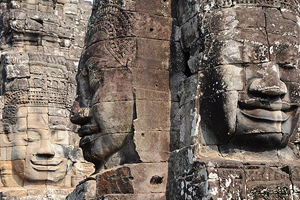 Many temples of Jayavarman were dedicated to gods with the “Tribuvhana-“ being part of their names. “Tri-bhuvana” means “three worlds” and refers to earth, heaven and underworld, together constituting the entire universe. Prasat Beng, listed as Prasat D, is a small temple with an impressive entrance ensemble of stone buildings instead of the common brick constructions. The temple is built of laterite with pillars and lintels of sandstone. 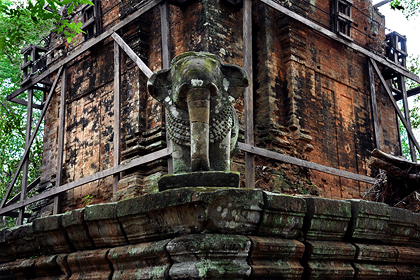 The pediments show a “flamboyant” style which can be found in Khmer architecture throughout the centuries. The group of temples called “North-Eastern Group” on this website includes Prasat Damrei, too, though it is situated to the south of the Rahal Baray. Together with similar temples nearby it could be separated as as another “Eastern” or “Central Group”. 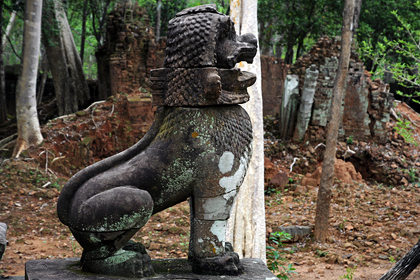 But it is uncommon to introduce an extra “group” of Koh Ker monuments. Usually guidebooks differentiate between only two temple groups outside walled city and its main temple complex, one close to the former reservoir and one further south. 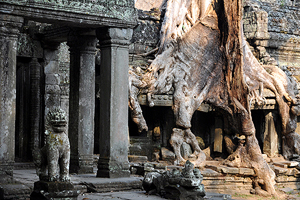 However, they disagree whether to attribute Banteay Pee Chean, Prasat Chrap and particularly Prasat Damrei to the northern or to the southern group. These three temples are not only situated in between the cores of those two groups, but they are of a different character, too. Northern Group temples have huge Prasats in small compounds, contain Lingams and they are oriented to the Rahal Baray. Southern Group temples are smaller single Prasats or groups of only few small Prasats oriented towards the east. Prasat Banteay Pee Chean, Prasat Chrap and Prasat Damrei are located closer to the Northern Group and they are oriented to the Rahal Baray, too. This is why they are, besides the Linga-Temples, included in the “North-Eastern Group” on this website. However, their layout differs from temples of both the Linga-Temples and the Southern Group temples. Their compounds are much larger and enclose more buildings than all those other temples of the Northern or Southern Group. 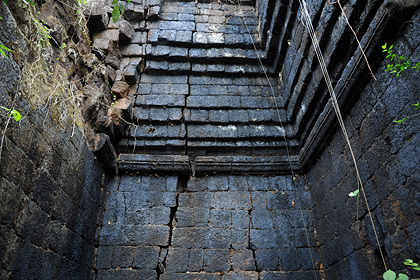 In contrast to the single-tower structures or smaller compounds of the Linga-Temples mentioned above they are called “Flat temple complexes” on this website, because they include more structures within larger enclosures but, in contrast to the vastest complex at Prasat Thom, no temple mountains (pyramids). Among those rarely visited monuments in Cambodia this is one of the most romantic Khmer ruins at all. 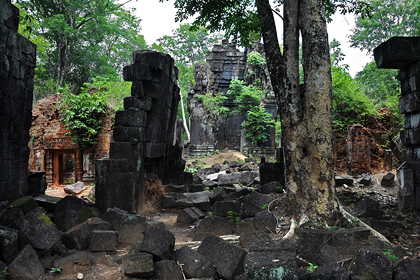 Indeed, Prasat Banteay Pee Chean, dedicated in 937, is one of the most picturesque monuments of Koh Ker. It will comes close to your phantasies about “lost temples in the jungle”. 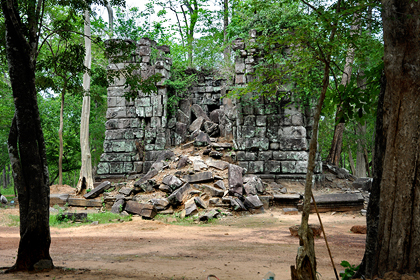 The central laterite tower, which is the largest structure of Banteay Pee Chean, was surrounded by eight brick buildings, they are mostly in ruins now. Two library buildings within the first (inner) enclosure were oriented eastwards like the main shrine, which is uncommon, usually they face the central shrine instead of paralleling it. The lintel of one of these libraries shows a carving in a good condition. Two enclosure walls with Gopuram gateways surround the central complex. The inner one had a monumental Gopura at the eastern side and a smaller one to the west. The western Gopuram has two lateral pediments decorated with low reliefs, they depict Yama, the god of judgement over the deceaced, on his mount. the buffalo. The reliefs are carved within an elaborate design of vegetal scrolls. Inscriptions at the door pillars of Prasat Banteay Pir Chan report that Jayavarman IV consecrated this temple to Prajapatishvara and that several donations were made to it. Prajapatishvara is an epithet of Lord Brahma. Prajapati was the first being according to the Vedic scriptures. Many texts of later Indian Puranas identify him with Brahma. 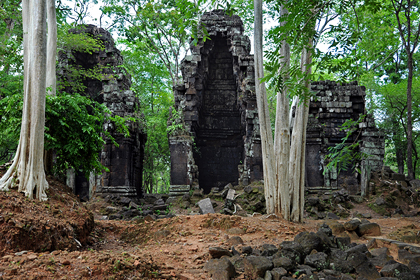 Prasat Banteay Pir Chan is the only Khmer monument dedicated exclusively to Brahma. Temples for Brahma worship are quite rare even in India. In Cambodia Brahma was venerated only in those Khmer temples dedicated to the Trimurti, the Hindu trinity of Shiva, Vishnu and Brahma. Usually they were Shiva temples in the first place, with three Prasats for the three deities, Shiva in the central and Brahma in the southern one. In other periods of ancient Khmer history temples were dedicated to Shiva, Vishnu and their local variants and to the Buddha or Bodhisattvas. Remarkably, there is no Buddhist temple in Koh Ker. So the three supreme beings venerated in Koh Ker were those of the Trimurti instead of Shiva and Vishnu and Buddha. Erroneously this monument was called Dong Kuk by Lunet des Lajonquière. Other spellings of “Pee Chean” are “Pichean” and “Pir Chan”. The pronunciation is “Peetshern”. 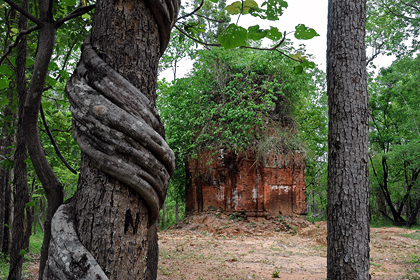 Prasat Chamres is a single brick tower, situated a little bit deeper in the jungle, in between the larger complexes of Prasat Banteay Pee Chean and Prasat Chrap. 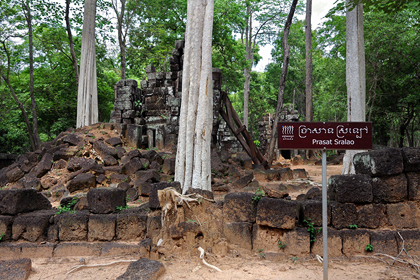 The superstructure of Prasat Chamres is completely overgrwon, making it a little bit a jungle temple. Prasat Chrap has two concentric enclosures. In the centre, three tall laterite towers stand in a row, all of them lost their front walls. There are only remnants of two more brick Prasats (or maybe library buildings) facing the principal group. 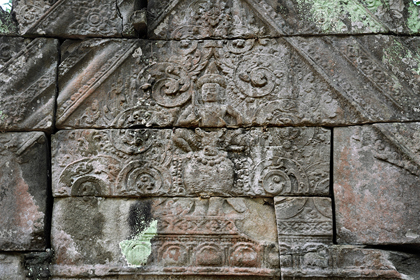 At Ang Khna, near Prasat Chrap, was found a group of Lingas and a stone carved with peculiar scenes, among them human figures in high relief including a series of bust figures in niches. At the edge of a stone are representations of the nine planets and eight mothers and eight great gods. Prasat Damrei means "Elephant temple", as it is noted for the large adorned sandstone elephants, facing outward at the four corners of the foundation of the central Prasat terrace. Only two are in a sound condition and in situ. Fine seated lions flanking the four stairways are impressive, too. But only one of the eight stone lions is still at the original place at the flight of steps. There are some small monuments close to Prasat Damrei. One of them is a smal basin. Rectangular reservoirs of modest size are called Trapeangs. 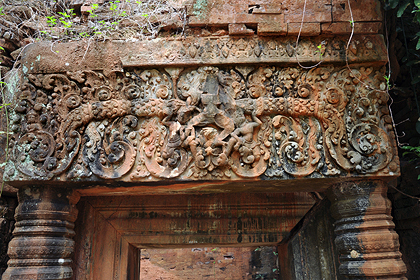 Trapang Khna near Prasat Damrei is decorated with carvings at the small edges.